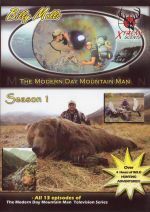 Enjoy over 4 hours of non-stop hunting action with big game guide Billy Molls on this 2-DVD set, The Modern Day Mountain Man, Season 3! Enjoy over 4 hours of non-stop hunting action on this 2-DVD set! 10 HUNTS IN ALL!!! The Modern Day Mountain Man was voted as one of the best hunting programs on Television. All 13 original episodes: Brown Bear, Dall sheep, caribou, and wolf in Alaska, and elk and mule deer from Idaho. Professional guide Billy Molls, takes you on an incredible journey. For over 4 months Billy documents his travels and hunts throughout North America. See what happens “behind the scenes” as a hunting guide who spends as many as 240 days of the year in a tent. If ever the essence and flavor of big game hunting has been recorded on film, this is it!